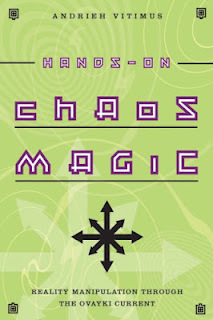 'Hands on Chaos Magic' was meant to be a detailed baseline magical training guide in practice. What I do not do a lot of, is put together recipes of how to combine different techniques. Psychic Self Defense using Hands On Chaos Magic ( re-copied from my original site Andriehvitimus.com which is offline, I just think this one is important). 1) First, remember this simple statistic: 95% of all spiritual attacks are purely psychological. We are great at producing our own reality and when we believe we are spiritually attacked we manifest that result. Many times it is very easy to believe that we have been spiritually attacked, and many people will respond to us with sympathy and support. This is very addicting and it feeds the victim parts of our personalities. We all have some of these tendencies. What to do about this tendency? a) Using Hands on Chaos Magic to find the victim shard of the self - Chapter 13 - Basically, personify that component of yourself into a form. The details are there in the book. Once you have experienced it as a form you can then evoke the form. From here, once it is personified and evoked (Chapter 28 in 'Hands On Chaos Magic' covers evocation) you can use techniques to transform that form into something more desirable. I am on an Angelic kick right now, and an Invocation of Haniel works great for this type of thing after you have the form personified. In Vodou, I would do a service to La Siren (who is the Ocean Mother in my house) or Damballah (if the issues were that severe). After you have the form evoked, you can actively pray, acknowledge and love that part of yourself. Often times, (nearly always) that is enough to radically change our own behavior. Once you feel like that part is transformed, reabsorb it- accepting it as part of who you are. Acceptance being the most important part of the process. If you need to dismiss this part of yourself, you can do this and you will need to do a few healing rituals to rebuild the self in line with what you want to become. b) Actively pursue mental control and wellness from an energy perspective. This means, in practice, to do the cleansing rituals and banishing. I recommend 2 times a day. There are several banishing and cleansing rituals in Hands on Chaos Magic, and more than that there is a tremendous amount of information on how to develop your own. c) Just laugh at it out loud. It's probably not that important anyway. Besides, what could you do with the time you'll have to focus on the positive things you want to create as opposed to the heavy, dark feeling of being "cursed". d) Meditate and try to do the self analysis to get over these issues. This is a core tenant of 'Hands On Chaos Magic' and - remember as I say at the end, being cursed is still just a story. Even if it did happen, you can absolutely control your reaction. Many parts of 'Hands On Chaos Magic' detail exactly that. 2) Sometimes, there was some negativity directed at you, or you picked up something that seems to have attached to you. Often, these attached things, although rare, are fragments of the dead. Kind of like parts of personalities that should have dissolved but didn't. In a way, these are like semi-autonomous thought forms. a) Cleansing and Banishing on a regular basis will usually take care of most sorcerers and attached spirits. Again, 'Hands On Chaos Magic' has lots of techniques for this. The important thing here is to actually do the work on a daily basis. Chapter 10 in 'Hands On Chaos Magic' is great for developing your own cleansing rituals. In addition, I also have a CDROM hypnotic process that can do this. All you have to do is listen to the CDrom and follow the directions. The process is called the 'Cascade of Light: Angelic Life Empowerment System Volume 1.' I am working to get this on my web site for sale, but you can contact me directly and get a copy at http://andriehvitimus.com/contactandrieh. b) Salt Bath. A simple thing I do is to take a shower with some salt. I will put some sea salt into one of those white mesh wedding bag. They are available at almost any craft store for a $1. Using the energy exercises in 'Hands On Chaos Magic', push any and all negativity into the salt - as described in the Salt Exercises in 'Hands On Chaos Magic'. When you take the shower, rub down and away. Do not rub up and down. Imagine using all of your senses to scrub all the negativity down and away. After you rub it all down, let all salt dissolve and go down the drain. You can also add essential oils to the salt to increase its effectiveness. How to work with the salt and oils in a talismanic way is found in Chapter 27 of 'Hands On Chaos Magic', although many chapters lead up to this. c) Laugh out loud for 15 minutes a day. No, I actually am serious. This is known as Laughter Yoga etc. Although people have tried to copyright it, it's just something easy to do. Laughter raises a lot of Qi in Qigong terms and does kind of shake loose the system. Make sure to meditate and relax after doing the laughter Meditation just to calm down the system (some people do need this). Other techniques such as the waterfall cleansing (In Hands On Chaos Magic), can also help. d) Evoke to help and remove issues often. Although we call it something different in Vodou, I will do service for Papa Legba and the Ancestors to remove negative influences often. Depending on who you work with, there are lots of ways to do this. Basically, again you can Evoke (meaning, to project those energies around you, using terms from 'Hands On Chaos Magic' this does not necessarily mean putting something into a triangle), to remove blocks and negativity. If you really and strongly perform the Lesser Banishing Ritual of the Pentagram, this is a type of evocation (I know the ceremonial magicians will disagree, but it is a projection not pulling in). Chapters 28 and 29, cover this in 'Hands On Chaos Magic'. e) Pay attention to your own Energy. Using just the energy work exercises, you can start from your center point (In Chinese Qigong, The lower dantianis located 1.3 inches, or 3 finger widths, below the navel and is also called the golden stove). In Western magic, typically this is done at the middle of the chest. Start from the center point you know and work outwards expelling negative energies as you feel them (that means anything you believe you should get rid of). Start from the center point and envision it as a white spot, and then feel that white spot as perfectly calm (or happy), and then while meditating, extend that white spot out forcing each part of your body it touches to become that calm (or happy ) vibe. This is extensively covered in 'Hands On Chaos Magic'as far as the energy work needed to get through and work the details. Along with this, meditate and clear your mind. Where the mind goes, the aura and body will follow. If you can clear your mind, it's that much more difficult to have negative energy, thought forms or spirits attach. f) Within multiple paradigms, an ancestral altar works great as a defense as well as being a wholly healthy and respectful component of spirituality. I can answer questions about an Ancestral Altar from a Vodou point of view and my own experience working with them. Having an active altar with a friendly godform or spirit, means that that spirit or godform can interact with your life. I have found this extremely useful. This is similar to some of the Radionics techniques that use technological and pseudo-scientific ways to leave a connection open (I like radionics, and if someone out there wants to trade me a nice machine for some work or coaching let me know). 3) Preventive Medicine is best. a) 'Hands on Chaos Magic' goes through several detailed variants to work you to the point that your auric shell can serve as a protective circle. b) Talismans will vibrate even when you are not thinking about them. Chapter 20-22 and 30 in 'Hands on Chaos Magic' have details on how to create talismans from a non-dogmatic POV. For now though, if you simply find a rock that you like and repeatedly put yourself into a happy state while using all of your five senses to know that the rock is vibrating more and more in that happy state, will be a good start. Keep doing the meditation for 30 minutes for a few days in a row and then carry the rock around. Notice what happens. If you know sigil magic, you can use a sigil to enhance the meditation. Many more techniques of course are in 'Hands On Chaos Magic'. c) Thought forms and servitors are your friend. Creating defensive servitors are a great way to prevent negative attachments and negative spell work. Servitors are a lot like imaginary friends and one technique I give in 'Hands On Chaos Magic' is to imagine that you have a imaginary friend around you. Just like a small child, tell stories about this protector and then meditate and imagine it is around. This simple technique is just the start. Chapters 30-33, in 'Hands On Chaos Magic' have many more details. d) Already covered using god forms for this purpose in the last point. Again, relationships with friendly spirits can in fact help immensely. Although this is not usually done in Chaos Magic, this is the exact method I recommend in 'Hands On Chaos Magic'. This is just a small sampling of how to put techniques from 'Hands On Chaos Magic' into a workable framework for Self-Defense. Remember, you are only limited by your imagination. Play with the universe. Do the Magic. While I do offer this general recipe for psychic self defense for free as a community service to help with general issues, I also offer customized and personal action plans, and can offer customized training to help you with psychic self-defense or any issue you might want to address. I work through a dedicated combination of intuitive reading, spiritual consultation and practical coaching. Taking a holistic view, combining the spiritual with rational thought and action means you have the greatest possibility of real life changes. You deserve that life. Contact me at andriehvitimus@gmail.com now to start.